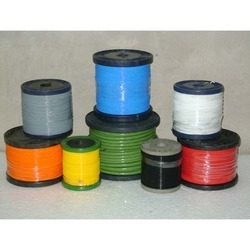 WE are leading a Manufacturer, supplier and exporter of PTFE Insulated Wires . Our product range also comprises of PTFE Insulated Cable, Teflon Wires, Teflon Cables, PTFE High Voltage Cables. These are available in various sizes and as per requirements of our clients. We offer PTFE Insulated Wires that are perfect for inclement weather conditions. The range is chemically immune to all reagents and atmospheres. Our range have thermal stability from -60 °C to +200 °C. Our light weight wires are small in diameter, low dielectric constant and dissipation factor and highest volume, and surface-resistant, flex-life, fire (flame) proof, resistant to ultra-violet radiation and suitable for high density wiring. We offer the range in standard solid colours with opaque and pink. Bi-colors are also available. Black to Pink Natural Opaque. Quality Control is an integral part of our business operations. The Products are Type approved by LCSO, (Inspectorate of Electronics, Ministry of Defense) Dept. of Space,Nuclear Power Corp. of India C-DOT etc. All products are minutely inspected at every stage of manufacturing as specified In JSS-51034 or other relevant standards.